Create a generation of problem solvers. Start with your youngest learners. Anyone, even young children, can think like an engineer. With Wee Engineer, reach ALL learners and build a strong foundation of problem solving and critical thinking. 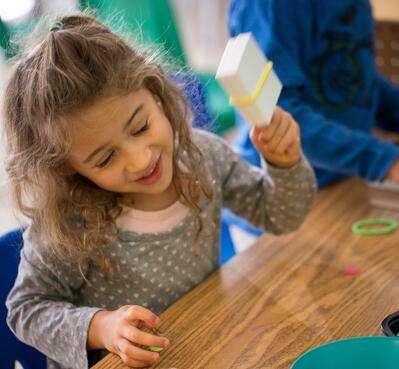 Hands-on engineering challenges empower young children to see themselves as problem solvers. They learn that there’s more than one way to solve a problem, and that it’s okay to fail and try again. During a well-designed engineering challenge, learners practice social, emotional, fine motor, cognitive, and language skills that will prepare them for later schooling. Build an understanding of how to solve problems as you tap into children's natural desire to explore the world around them. 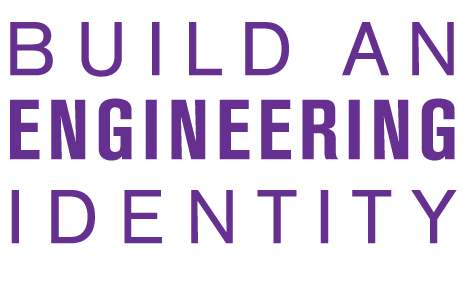 The project-based learning, materials exploration, and guided reflection built into Wee Engineer help children practice vital skills in the social, emotional, physical, cognitive, and language domains. 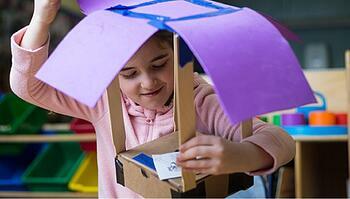 Engineering is a fun way to help children think about the designed world in which they live. Through engineering design challenges, educators can empower their young learners to solve problems creatively and collaboratively. We designed and tested Wee Engineer with educators in the field to ensure its four engaging, hands-on challenges match preschoolers’ abilities, interests, and attention spans. We created a unique, age-appropriate engineering design process specifically for preschoolers. By following its three steps—explore, create, improve—young children learn not only how to solve problems, but how to reflect on the process and improve their designs. Each Wee Engineer challenge connects to a typical “station” that is common in a preschool and/or PreK setting, for example, a water table or block area. Young learners are natural engineers, ready to innovate and eager to explore the world around them. With Wee Engineer, reach ALL learners and build a strong foundation of problem solving and critical thinking. Below, educator Sioux Wereska shares how Wee Engineer showed her a new side of her Pre-K students. 3-Step engineering design process guides learning: Explore, Create, Improve. Explore available educator and family resources that help bring engineering to life. What does engineering look like in preschool? Check out this sample challenge from Wee Engineer, where students are challenged to design a noisemaker for a friendly puppet.